VANCOUVER, BC – The new Fairmont Pacific Rim Hotel, due to open late in January, has commissioned award winning BC architect McFarlane + Green + Biggar to design a Fazioli piano. The $225,000 satin white Fazioli piano will feature a stunning 3D design underneath the lid, has many parts plated in 18K gold, and will be a permanent attraction of the hotel lobby. 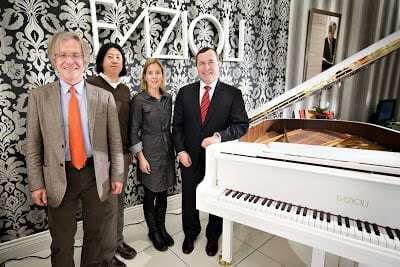 Founder Paolo Fazioli travelled from Italy to personally unveil the one-of-a-kind white piano at a media event for the piano. Architects Michelle Biggar and Seng Tsoi from McFarlane + Green + Biggar were also present together with Fairmont Hotel General Manager Randy Zupanski.